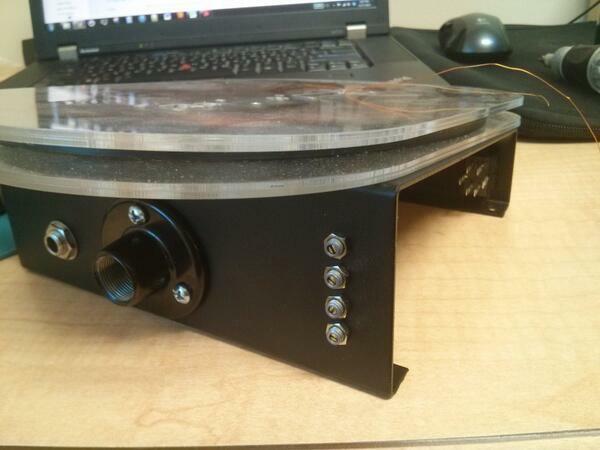 Posted in: Out in the World, Updates on the Magnetic Cello. This weekend, I traveled back home to LA to catch Ben Sollee, the genre-bending singer-songwriter-cellist from Kentucky who picked up the Magnetic Cello last year. I was there to see my MC V.7.1 #2, the Magnetic Cello that Ben more affectionately calls “Maggie”. Ben switched from his acoustic cello to Maggie for the second half of his song “Electrified“, rounding off the song with high velocity notes that are only possible with magnetic articulation. After the show but before the crowd left, I jumped on stage (next time I’ll talk to management before pulling this stunt). I explained to those who were interested how the instrument worked, and gave a demo on how it was played. A few fellow Ben fans were brave enough to try out Maggie. I also had a chance to get feedback on the instrument with Ben. We talked about how the bow currently works and ways string switching could be improved (above), and other changes that could eventually find their way into the instrument. I also learned of the importance of including a good case for the Magnetic Cello. 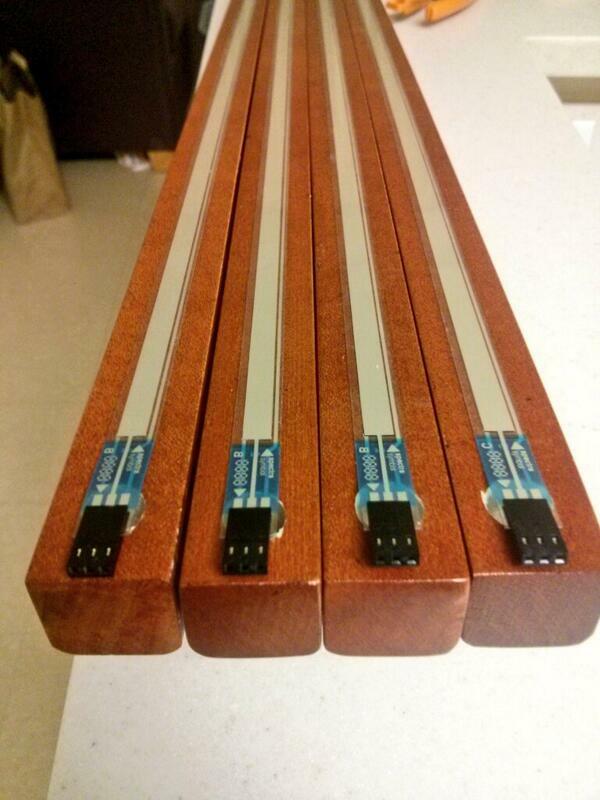 We’ll be adding the option to ship the instruments with hard case included soon. There are no recordings of the show this weekend (as far as I know), but rumor is that Ben has been working on a video with the instrument. From what I’ve seen, it does, indeed, bend genres. 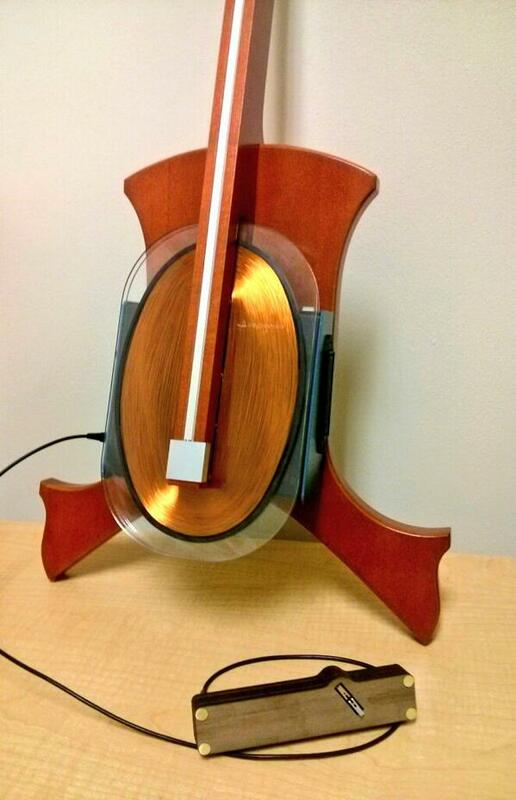 Posted in: Updates on the Magnetic Cello. 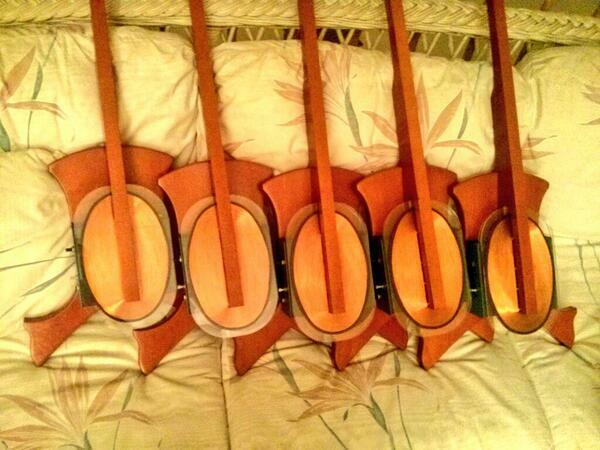 Five more Magnetic Cellos are done. These instruments are functionally the same as our last batch of Magnetic Cellos, but there are a few minor cosmetic changes, and a few differences that makes assembly a smarter process. We realized, just as we begun making the magnetic bows, that using well-placed rivets would be a cleaner and more efficient to build. Now, instead of gluing each layer together, the bow is held together with cutlery rivets (the same kind that hold the handles of knives and other kitchen tools together). The heads of these rivets are very low away from where the bow is held during play, so they don’t get in the way. Stronger, Prettier, and Easier to Build. We’ve got all the packaging material we need to ship these instruments out to you, but first, we have to update our user manual and make sure our website is polished. Expect it to be in stock in 2 or 4 weeks. 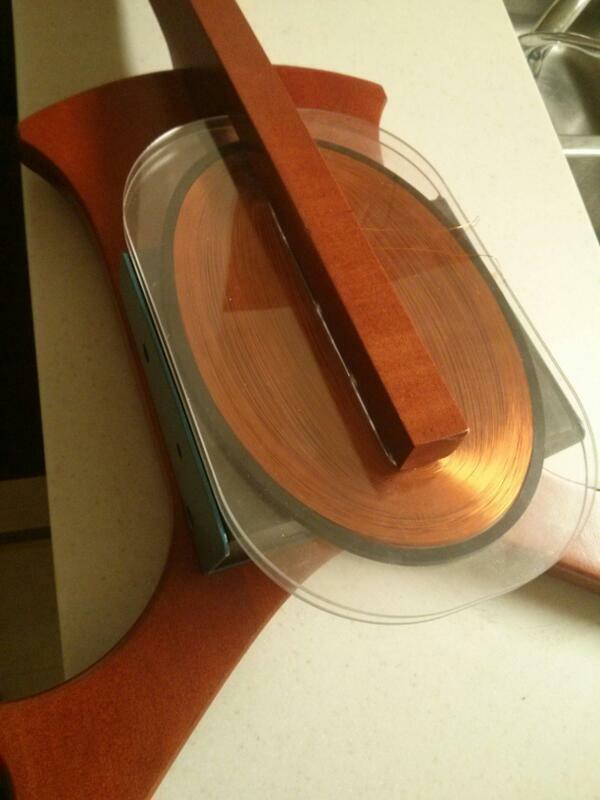 In the meantime… what’s this? A new video? 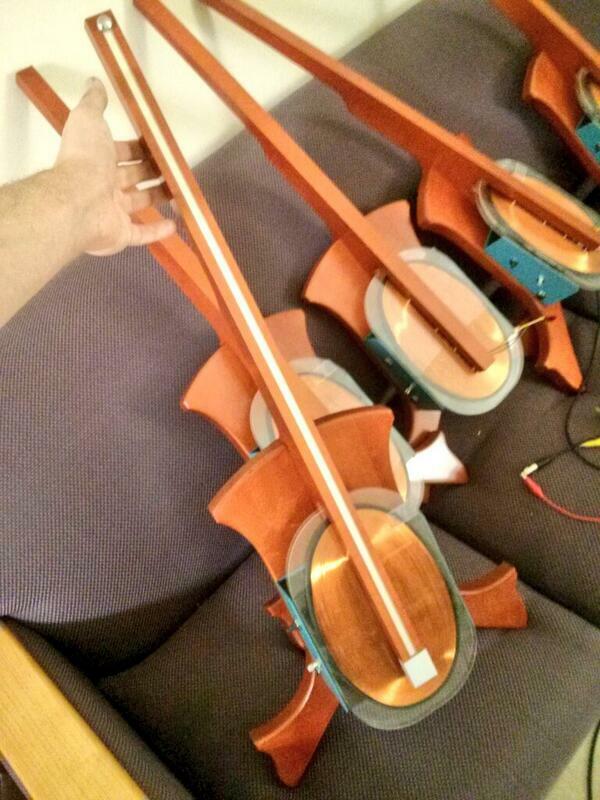 4 Magnetic Cellos with Ribbons Attached. We installed the ribbons on the Magnetic Cellos last night, and that means that for the most part, the main instrument is complete. We still have to cut out covers that will hide the ribbon connectors, but that will only take an hour at the hacksaw. Before we sell each instrument, we’re going to disassemble them one more time, inspecting the solder joints, making sure everything is clean, and doing some final tuning. But for now, the instrument is finished. The Ribbon, Topped of with Metallic Button. 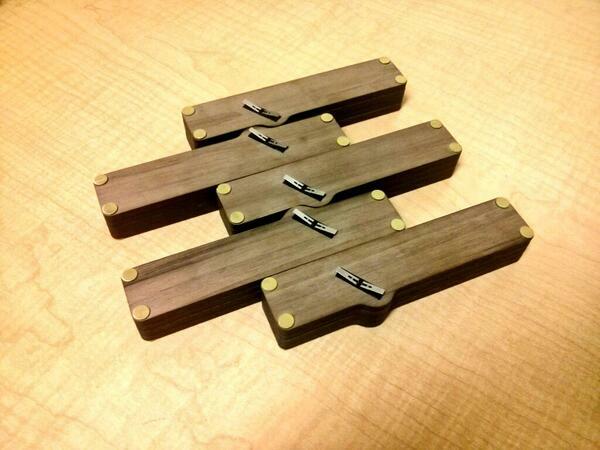 Next, we’ll be building the peripherals: the magnetic bow and the end pin. We ordered custom metallic stickers to brand each instrument, and will soon be ordering custom dimensioned boxes for shipping. In the meantime, we finally know what the final instrument looks like! 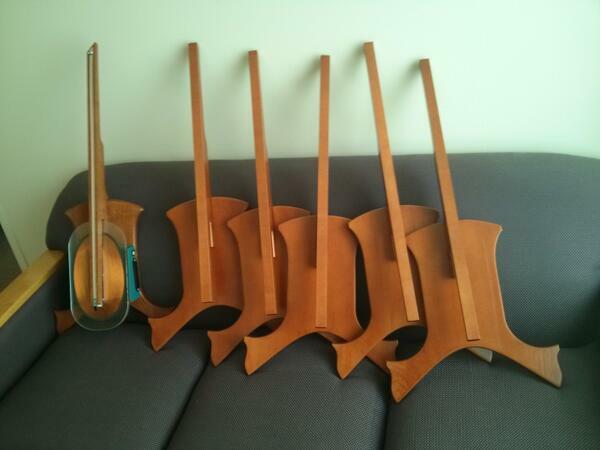 We’re getting close to a finished batch of 5 instruments. The coils have been spun, the circuit boards installed, the screw holes drilled, and the body, neck, box and coil are assembled together. Other than installing the ribbon, every large job has been done. It is now a matter of wrapping up every detail. I was sick for a few days during the holidays so we weren’t quite able to get everything done during the holidays, but things should be put together by the end of January. The resistive ribbons still need to be installed and there is some final soldering and wiring needed in the box of each instrument, and we need to assemble the end pin that will hold the instrument up. Then we’ll need to do more quality assurance, print out branding stickers, and get the shipping supplies ready. We can’t wait to get the next round of instruments out into the world. 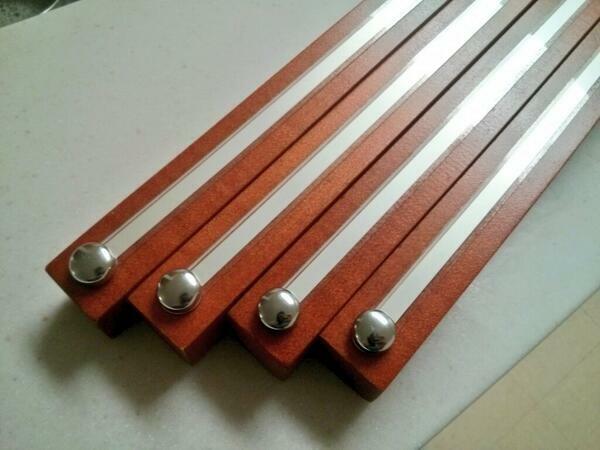 Another quick update, now that I’m half way thought building the next batch of Magnetic Cellos. Last summer I designed the boards so that all the resistors (the blue things) and capacitors (those orange/tan pieces) were in neat rows. 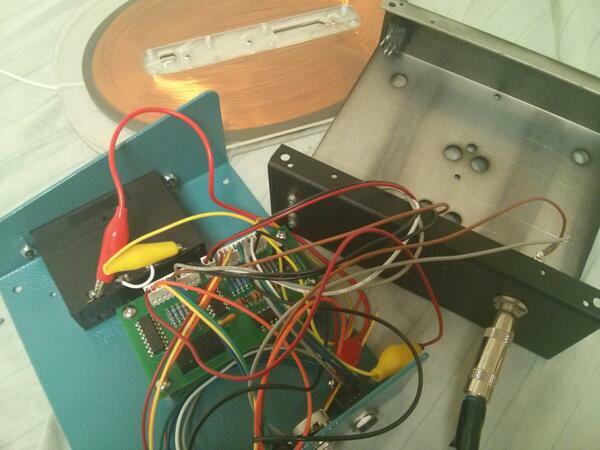 This made placing and soldering each part a much more organized and streamlined process. 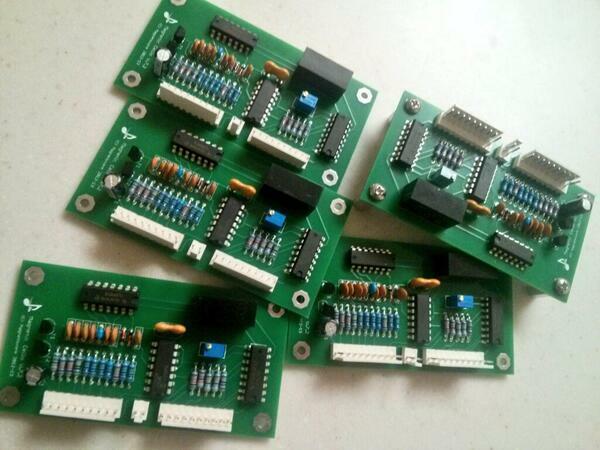 Thanks to planning ahead (and a nice new iron) I was able to solder these 5 boards in only about 6 hours. It’s amazing how it is only a little bit harder to do something 5 times vs. once. After I figured out the best way to wire a part the first time, repeating the process 4 more times was almost automatic. Thanks to this small-scale series production, I was able to complete some 700 board and 120 panel solder joints in around 12 hours. 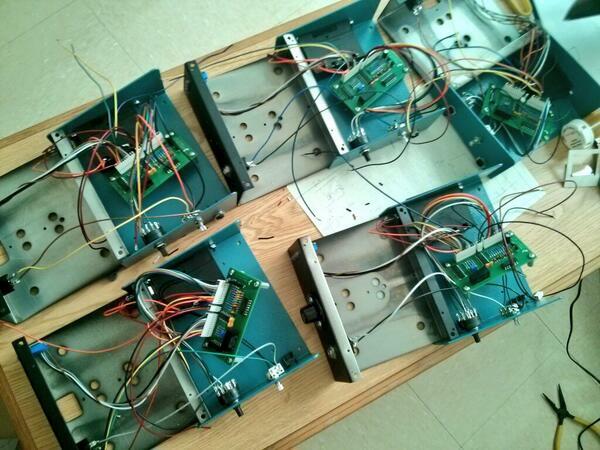 We’ll soon find out if I’m able to work as effectively in the next stages of assembling the instruments. I still have to wind the coil, install the ribbon, fit the box into the wooden body, glue together the bows, and do some final wiring, all while verifying that everything is working properly and up to spec along the way. The plan is to have the main instruments done by Christmas, and to finish the bows and wrap up final details in early January. All the things I need to build the boxes for the next run of Magnetic Cellos have come in. 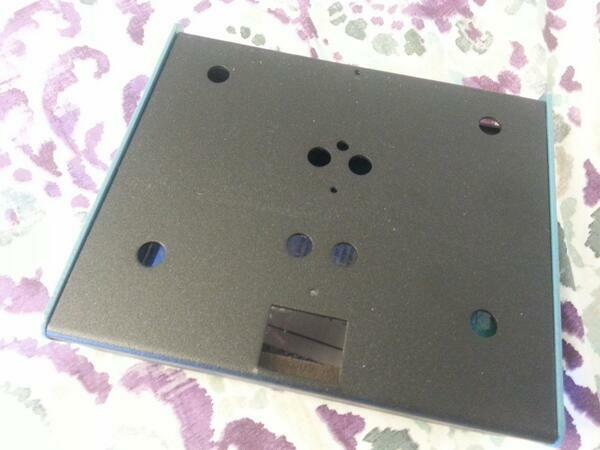 Switches, power switches, battery drawer, tuners are now pressed, screwed, or otherwise mounted into their respective cutouts in the metal boxes. 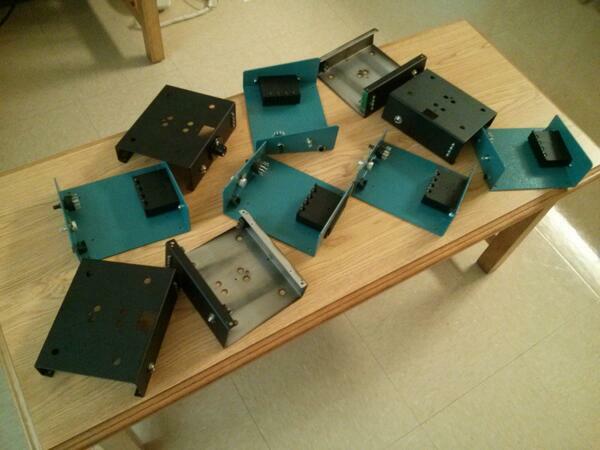 So far, I have mostly finished wiring together only one box. But, after testing out the complete electrical package, I’m very happy with the results. The coil responds how I hoped it would, and the variety of tones give the instrument a lot of versatility. The original square, reedy tone is still there, but now there are two smoother, flutter tones, and… a mode that can only be called “Dubstep”. Think “Wub Wub”. This last tone is actually a happy accident; I was expecting a sine output when I stuck the BJT in the circuit like that. 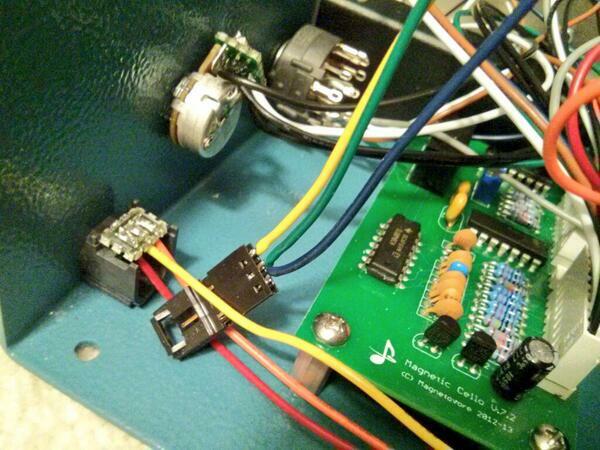 But I like the tone, and think it deserves a place on the instrument… on the far end of the tone knob. That’s all I have for now. I’ll be testing the last few functions on the first box, and then wiring together the rest of the boxes over the next few weeks. More Rainbow Spaghetti headed your way. 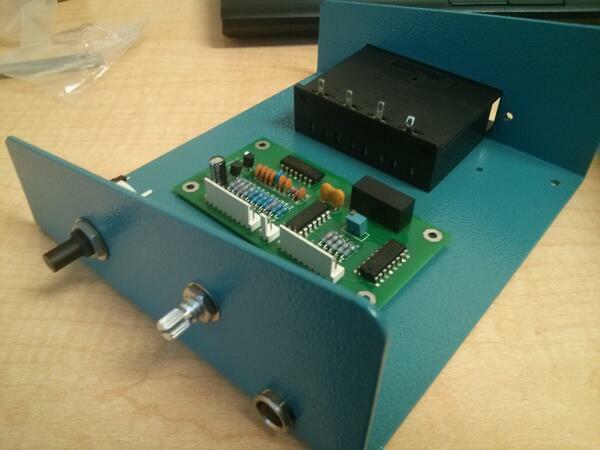 Custom box and body, fitting together with the coil. Audio out, end pin connector, tuners, and power switch, with the coil on top. Tone and volume knobs, bow cable connector, with the circuit and battery holder above. So now I have all the custom parts I need to make the next batch of instruments! While it took a half year to figure out the logistics of specifying and then ordering special parts, bringing in professionals has really boosted the polish of the final instrument. It looks like the 8 days I spent cutting up wood, and the 2 days right after that I spent drilling holes in boxes, was a one time thing. Now I have the help of a metalworking shop and an old school woodworker. Features and details outlined in development blog may change without notice. Please consult product store page for finalized specifications.